Notable Blacks of Cleveland contains approximately 2000 images of 500 individuals selected from the photographs in the Cleveland Press Collection. This collection was donated to the Cleveland State University Library when that newspaper ceased publication in 1982. The photographs in the collection generally date from the 1920’s on, with most of them from 1960 to 1982. The collection is arranged alphabetically by the last name of the individuals. Links have been provided to biographies that are available in the Encyclopedia of Cleveland History . Before Carl Stokes, there was Thomas Fleming, Cleveland’s first black city councilman. But since he took office 100 years ago, Fleming, who rose to the heights of political power, has been almost erased from our public consciousness — all over $200 and a clambake. ON HIS JUDGMENT DAY, Thomas W. Fleming greeted the courtroom with a smile. Beside him, his wife, Lethia, held a black scarf over her face to foil the cameramen. But Fleming, wearing a three-piece suit and a big-cuffed, knee-length topcoat, flashed the same welcoming, generous grin Cleveland had known for 20 years. His soft, friendly face, round cheeks and lively brown eyes reflected the tenacious optimism that had carried him up from his barbershop to a seat on Cleveland City Council, the first ever held by a black man. His cheerfulness wasn’t just a façade or first impression, but part of his core belief that careful work, well-tended friendships and political compromise would overcome prejudice and win more prosperity and respect for his people than angry protest. As Fleming walked up the aisle, nodding to his friends from the Central Avenue neighborhood and the reporters he knew from City Hall, would-be spectators in the hallway rushed toward the courtroom, hoping to see the trial’s end. “Just the reporters!” barked the bailiff, blocking their way. All that week, Clevelanders had gathered on the courthouse’s fifth floor: women in fur-collared coats, men wearing fedoras or newsboy caps, waiting in line for a seat at the trial. Most were black, and since they’d been kids, or moved to Cleveland from the South, Fleming had been their only black elected official, their neighborhood councilman, the man they’d turned to for jobs or help with a court case. Now, they’d come to see if the prosecutor had discovered a side of Fleming they hadn’t seen, if it was true that he had taken a bribe from a disabled policeman, if he would remain in power or see his career come to an end. Fleming walked to the defense table and sat in the chair he’d occupied all week. Three photographers, near the judge’s bench, aimed their tripod cameras at him. The jurors entered the room and took their seats. Only two of the 12 looked at Fleming. “Have you agreed upon a verdict?” the clerk asked. “We have,” the foreman replied. TODAY, 100 YEARS AFTER Thomas W. Fleming became Cleveland’s first black city councilman, he is all but erased from our history. We take pride in Carl Stokes’ 1967 election as America’s first black big-city mayor, but not Fleming’s pioneering victory because his life story is no simple tale of racial uplift. In February 1929, his career was marred by a sudden, shocking scandal that sounded notes all too familiar to Clevelanders in 2010: money exchanged at a clambake fundraiser followed by angry accusations that his enemies and the press conspired to bring him down. Throughout his 15 years on council, even as he became one of City Hall’s most powerful men, questions trailed Fleming about his part in the ruthless Republican political machine, his work as a lawyer defending gamblers and prostitutes, the lawless growth of vice in his ward, his alliance with a swaggering saloonkeeper who controlled a grimy underworld. Fleming’s memoir, My Rise and Persecution, was never published. He was even left out of the 1969 book Memorable Negroes in Cleveland’s Past. But Fleming was memorable, one of Cleveland’s great characters of the 1910s and 1920s, cheerful and optimistic, clever and folksy. A shrewd ward politician, Fleming delivered more votes for Republican mayors than anyone and brought his neighborhood big gifts made of brick and concrete. After he and his wife helped Ohio’s Warren G. Harding win the presidency, Fleming audaciously asked Harding to name him to the same post his hero, abolitionist Frederick Douglass, had once held: minister to Haiti. When Cleveland’s black population exploded in the 1910s and 1920s as neighborhoods filled with families who’d left the Jim Crow South to follow freedom’s North Star, Fleming was their lone voice at City Hall, their one-man hiring hall, the most powerful black man in the city. At a time when African-American leaders debated whether to agitate for social equality or focus on self-improvement, whether to join political machines or oppose them, Fleming, a classic politician, chose the machine. He made deals, granted favors and called them in. Until he granted one favor too many. ON ELECTION NIGHT 1888 in small-town Meadville, Pa., 14-year-old Thomas Fleming stayed out late, leaving his mother worried at home. He stood outside the Commercial Hotel downtown, home to one of Meadville’s few telegraph offices, and listened to the returns until he heard his candidate, Benjamin Harrison, had been elected president. From an early age, Fleming had seen black men claim a place in his hometown’s civic life. At 6, he was transferred from an all-black school to an integrated one thanks to the protests of prominent black taxpayers. When he was 11, his boss, a black bakery owner, won election to the Meadville council. “His election proved to me, even at my early age, that there was a chance for Colored men to rise in America,” he later wrote. At 16, Fleming beat the mayor’s son, a college student, in a debate, arguing against restricting the vote to the educated. The debate wasn’t academic to him: Fleming had quit school at 12 to work as a barber to help his mother support him and his two sisters. In 1893, Fleming rode a westbound train into Cleveland’s Union Depot, figuring he’d stay a few days then head to the world’s fair in Chicago. Instead, he never left, discovering that Cleveland was a good place for a young black tradesman to establish himself. Although the city’s few thousand black residents were often barred from industrial jobs and some restaurants and theaters, they found work as hotel employees, teachers and barbers. Fleming, already a veteran barber, started his own shop on Euclid Avenue within a year. In 1899, he moved into the barbershop in the new Chamber of Commerce building on Public Square. As Fleming trimmed and shaved powerful men in the sixth-floor Chamber Club rooms, some noticed that their barber, snipping and chatting away, possessed a political mind as sharp as his razors. Like almost all black Americans a generation after the Civil War, Fleming supported the Republicans, the party of Abraham Lincoln, which was usually willing to hire black workers and slate black candidates for the ballot. A strain of racial progressivism had run through Cleveland politics for decades: Before the war, the Western Reserve, settled by New Englanders, had been an outpost of abolitionism. Despite the city’s small black population, its voters elected two black candidates to the state legislature in the 1890s. Fleming met one of them in 1894 after joining a quartet that sang at rallies for the Republican mayoral candidate. One night, at an East Side meeting hall, he heard an inspiring speech by state Rep. Harry C. Smith, a hero to black Ohioans, who had just helped pass a civil rights law that banned discrimination in public places. Smith’s angry, militant editorials in his newspaper, the Gazette, denounced minstrel shows, racist laws and segregated schools. Impressed, Fleming became a protégé of Smith’s, stopping by his office nearly every day for political advice. On Monday nights after work, Fleming would walk to the old City Hall on Superior Avenue, climb to the fifth floor, sit in the gallery and watch the councilmen debate. And one night around 1903, his eyes sweeping across the dozens of desks on the crowded floor, Fleming, not quite 30 years old, had a vision. THE FLOWERS WEREN’T all for him, but they still smelled sweet. As Fleming strode into the City Council chamber on Jan. 3, 1910, applause rained down on him from the packed gallery. The mingled fragrances from bouquets blooming on each councilman’s desk filled the room and reached out to him. He squeezed his stocky frame between the desks until he reached his chair, where his mother, sister and friends awaited. There were gifts from groups he’d co-founded: a horseshoe made of flowers from the Attucks Republican Club, a floral basket from the Cleveland Association of Colored Men. He was now Thomas W. Fleming, councilman-at-large, the town’s first black city councilman. In the seven years since he’d first envisioned this moment, Fleming had studied law at night, become a lawyer, spoken at political meetings, courted powerful friends, forged alliances and started his own newspaper. When a shrewd Republican had warned him he had no political future unless he aligned himself with Mark Hanna, Cleveland’s powerful U.S. senator and friend to presidents, Fleming promptly dumped a candidate supported by his mentor Smith and supported Hanna’s man for the post. Smith never forgave him, but as a political move, Fleming’s switch was shrewd; his standing in the Republican party rose from then on while Smith’s fell. The council’s business was swift that night. Fleming was one of about 20 new councilmen, part of a Republican landslide that had also knocked legendary mayor Tom L. Johnson out of office. Spectators, crushed together in the balcony, looked on as Herman C. Baehr, the new mayor, mounted the podium and asked the councilmen to help build the Detroit-Superior Bridge and a new City Hall on Lakeside Avenue and annex Lakewood and East Cleveland. After the meeting and a celebratory supper with family, Fleming headed to the Starlight Café, his friend Albert D. “Starlight” Boyd’s saloon. Tobacco smoke and 200 people filled the banquet hall. Speaker after speaker rose to applaud Fleming: the county treasurer, a deputy sheriff and, most impressive of all, Maurice Maschke, county recorder and undisputed leader of Cleveland’s triumphant Republican machine. But Fleming’s raucous party appalled Smith. The councilman’s betrayed ex-mentor was uncompromising, exacting in his righteousness. Smith so hated segregation, he even opposed Karamu House’s race-conscious approach to theater. He found politics’ awkward alliances distasteful, refusing to support Baehr because the new mayor, as county recorder, hadn’t hired any black employees. And Smith knew too much about Fleming’s chums. Sometime around 1900, Maurice Maschke, an ambitious Republican operative, walked into Starlight’s Canal Road saloon. Amid the drinking and the presence of ill-reputed women with names such as Lotta the Small, Maschke saw the raw materials of power. Back then, when big-city political parties served as social clubs and mutual-aid societies, a saloon could double as a party headquarters where a smart ward leader could gather and barter a political machine’s essential fuels: money, loyalty, generosity, jobs, votes. Starlight Boyd — it’s unclear which came first, his nickname or his star-shaped, diamond-studded watch charm — was as shrewd and calculating as Maschke. So the former hotel bookkeeper and the aspiring politician forged an alliance. Boyd became a Republican poll worker then a ward leader, a man who could get out the black vote and help tip the balance of local power. Fleming didn’t need Boyd to succeed — not at first. In fact, his own alliances with Maschke and other white Republicans got him onto the party’s candidate list for City Council in 1907 despite Boyd’s opposition. Two years later, running as a citywide, at-large candidate, Fleming swung into council on the Republican landslide. He swung back out in 1911 when Newton D. Baker led the Democrats to a rout, but not before his loyalty to Mayor Baehr garnered jobs for more than a dozen black workers: a park policeman, a deputy building inspector, a notice clerk, a storeroom supervisor, two janitors, several garbage collectors. Paltry spoils, but to Fleming, progress. But after Fleming won the 11th Ward council seat in 1915, he needed Boyd. 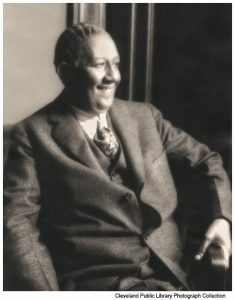 His memoir shows no qualms about befriending him, only satisfaction in a friendship and a lucrative business venture, their Starlight Realty and Investment Co. For black Clevelanders in the mid-1910s, allying with Boyd was the way to power. Fleming and Boyd ruled the ward together. The councilman showered Central Avenue with City Hall’s blessings: a newly paved street, new streetlights, a new bathhouse. Boyd kept turning out the votes. Naturally, Fleming and Cleveland’s Republican mayors were grateful. That’s why Starlight’s Z-Douglass Club on Central Avenue became one of the most infamous gambling clubs in the “Roarin’ Third” police district, yet attracted less than its fair share of police attention. One night in 1921, the righteous Smith stopped by the Z-Douglass Club and told Boyd he might run for Fleming’s council seat. Smith and Fleming supporters rallied and argued. Smith’s election-eve torchlight parade attracted 1,500 marchers. Election Day on Central Avenue looked like a holiday, as if the whole neighborhood had taken the day off to swarm the polls. Police, stationed at every voting place, broke up several fistfights and arguments. Fleming won, 2,830 to 2,053. Soon after, Boyd fell ill with pneumonia. Exhausted by the campaign, he died a month after Election Day, at age 50. BY 1927, FLEMING HAD achieved more than he’d even imagined as a young man. He owned a beautiful house on East 40th, one of the city’s most prominent streets. That summer, he and his wife, Lethia, sailed on a cruise ship to Europe, toured Windsor Castle and Westminster Abbey in London, ate dinner atop Switzerland’s Mont Blanc, gambled in Monte Carlo, glided through the Venice canals on a gondola and saw Josephine Baker dance at the Folies Bergère and at her private club, Chez Josephine, in Paris. At home, Fleming had become the most powerful black politician in Cleveland’s history. Maurice Maschke had become chairman of the Cuyahoga County Republicans, and reporters described Fleming as one of his key lieutenants, the “left bower” in the party boss’s euchre hand. In return for his loyal vote on council and his constituents’ votes on Election Day, Fleming won better pay and increasingly prominent government jobs for black workers: clerks, road foremen, two prosecutors. He’d gotten City Council to ban the Ku Klux Klan from marching in the city — and the Klan had retaliated by dropping angry fliers on Cleveland’s black neighborhoods from a plane. Smith, sniping in theGazette, might not have been satisfied, but Fleming’s alliances had brought results. In the 11th Ward, Fleming tried to keep the vice raids at bay though police launched a few while he was overseas. For eight years, Fleming had chaired the council’s police and fire committee, setting cops’ salaries and pensions, while defending gamblers, Prohibition-defying liquor dealers and prostitutes as a lawyer in police court. Detective Walter Oehme was one of those men, a tough, husky cop until he was injured in a fight with a speakeasy’s drug-addicted spittoon-cleaner. Unable to stand on his own or lift his arms above his shoulders, Oehme, living on a pension of $87 a month, asked Fleming to get council to pay his medical bills. Fleming’s ordinance granting Oehme $1,740 passed while he was in Europe. When Fleming got home, Oehme approached him again. On Sept. 27, 1927, Oehme’s wife drove him to the Colored Elks’ Club on East 55th Street, where Fleming was getting ready for his clambake fundraiser, and Oehme handed the councilman a $200 check. THE DOORBELL WOKE Tom Fleming after midnight. He was so tired, he ignored it at first, but Lethia said it might be a telegram or special delivery. So he shook off his sleep, put on his blue and red bathrobe and red leather slippers and went to the front door. Three Plain Dealer reporters crowded in, excited. They asked if he’d quarreled with Walter Oehme after the council meeting that evening, Jan. 21, 1929. “Why, no,” Fleming replied — their chat had gone just fine. But the reporters told him Oehme had come to the Plain Dealer office, saying Fleming had insulted him and alleging Fleming had shaken him down for a $200 check. “Boys, do you think for one moment I would take a check for a bribe?” Fleming laughed. The reporters assured Fleming they were serious. “It’s a lie!” he shouted. Fleming later claimed he was so dumbfounded at the accusation, he didn’t recall his exchange with Oehme a year and a half earlier. “If he thinks he got a check, let him produce it!” Fleming said. The reporters looked down the tastefully carpeted hall, where portraits of great Republicans hung on one wall, an old photo of Fleming in a summer suit on another. In the distance they saw Fleming’s living room, with books lining the shelves, and the dining room, filled with gleaming silver and white linen. They told Fleming to look for the Plain Dealer in the morning and left. When dawn broke, Fleming went to his porch and picked up the paper. “Crippled Policeman Says He Paid Fleming $200 After Council Action,” the headline read. The same day, Oehme produced a cancelled check with his and Fleming’s signatures on the back. Prosecutor Ray T. Miller called Oehme to testify before a grand jury, which promptly indicted Fleming on charges of soliciting and accepting a bribe. Fleming’s supporters rallied at meetings across the Central neighborhood, calling the indictment “rushed through” and accusing the Plain Dealer of sensationalism and “trying his case • outside the courts.” Harry C. Smith played it cool, writing that “the great mass of our good people” disapproved of the rallies and would wait to see how the case turned out. OEHME LEANED on the prosecutor’s arm as he walked shakily to the witness stand. He testified that the $1,740 from the city hadn’t been enough to pay all his medical bills. But when he went to Fleming for more help, the councilman had responded, “Did you save any of it for me?” Oehme said he’d told Fleming he had another $354 in medical debts. “Get me some money and I’ll see what I can do,” he claimed Fleming said. So Oehme borrowed $200 from his step-grandfather, signed the check over to Fleming, and handed it to him at the Colored Elks’ Club. Oehme said no one else had been present. Oehme’s wife backed up his story, claiming she’d heard Fleming ask for money. Two city councilmen testified Oehme had told them about the bribe a year earlier. Two witnesses testified they saw Oehme hand the check to Fleming and take cash back from him. Character witnesses, including several judges, lined up to testify for Fleming. The trial lasted three days. The jury — eight men, four women, all white — deliberated for 13 hours and delivered their verdict on a Friday morning. The foreman gave it to the clerk, who read it in a deep, booming voice: Not guilty of soliciting a bribe. Guilty of accepting one. Fleming drummed his fingers on the table, then clenched his fist tight. He scowled. Lethia patted him soothingly on the back. FLEMING SERVED 27 months in prison. He returned to Cleveland in January 1933 and greeted visitors at his home on East 40th Street with the same old friendly smile. In his memoir, however, Fleming’s sense of persecution shaded into dark paranoia. He blamed the Democratic prosecutor, the Plain Dealerand the Klan for his conviction. “I figured the Ku Klux Klan had been secretly working to frame me ever since that organization scattered those thousands of cards from an airplane among the people of my District,” he wrote. In one of his many appeals, Fleming’s lawyer had claimed several jurors at his trial were Klansmen, but they’d denied it. Cleveland had moved on. With Fleming gone, the city’s black population, which had grown from 8,400 to more than 70,000 during his years in council, had turned to new leaders. Two more black councilmen had been elected in 1928, and Fleming’s minister had replaced him on council. The press asked Fleming if he’d try to come back, but he demurred. Two years later, Fleming won permission to practice law again and set up an office in his home. Judges, lawyers and city manager William Hopkins sent him congratulations. But two cerebral hemorrhages sent him to the hospital in 1936 and left him in a wheelchair. Fleming outlived his rival, Harry C. Smith. He, too, was stricken with a cerebral hemorrhage and died in his newspaper office in 1941. A near-hermit by then, with few friends, he left his estate to a German-American woman described as his friend, tenant and housekeeper. When Fleming died in 1948, the police chief, countless Elks, Mashcke’s widow and all the councilman from Cleveland’s black wards came to Friendship Baptist Church for the funeral. His coffin lay on the altar, covered with flowers. Years later, his niece would insist that Fleming didn’t die of poor health, but of the heartbreak inflicted by his bribery conviction. African-Americans in Cleveland Documentary produced in 1996. A self-guided tour of sites with historical significance related to the black community in Cleveland. Developed by the Plain Dealer.